Trash day in New York City is gross. I’ve lived on the upper west side for 57 years and Mondays, Wednesday, and Fridays, if I have to leave my apartment at all, I do so with the darkest sunglasses and greatest hurry. Trash day brings out the humanity in humanity and I can’t stand it. The diaper wrappers, television boxes, kale stem refuse, FreshDirect coupons. The stunning, self-obsessiveness of humanity, cloaked in black plastic and tied in a square knot. Soon to be packed into massive steel beetles and carted off to the so-incorrectly named, “landfill,” like there was a lack of land there and we as a race are restoring it to proper working order. Self-indulgent assholes, all of us. A man in Palestine was once killed when he was crushed in a trash compactor. That’s humanity for you. I work at a publishing company downtown, Macmillenian U.S. On the three days a week where I take extra precaution to hide from humanity, more than my year-round, cultivatedly off grey New Yorker pallor, I don a pair of as out-of-fashion sunglasses as I can find and dive into the subway and onto the One. I hide behind my New Yorker for the whole ride. I’ve been known to check no more than a single issue at a coat check, forcing the stupefied attendant to grapple with whether the magazine deserves its own hanger or if she is supposed to just lay it delicately on the floor. Maybe she can peek at it once I’ve left the vicinity? I enjoy watching this process. I leave the train at 18th Street and walk east. At work, I read glorious nothings which are, like the trash laid out in squalid sacrifice to Capitalism on Mondays, Wednesdays, and Fridays, further tribute to the self-absorption of humanity. I feel grateful to live at a time when the extraordinary reality of self-conscious life is so profoundly abused. That was sarcasm. Consciousness is a hard problem only in regard to ease with which youth trivializes it. I read manuscripts. I reject manuscripts. I write short receipts in response to the manuscripts I reject. I give them to my secretary who sends them to whomever wrote the manuscript. I reject all the manuscripts I read. If I do not reject a manuscript, I re-read it, and then I reject it. This is what makes me good at my job. I am the only goddam person left in this godforsaken country who cares. If I sound callous, it’s because I am. “I love you,” she said, “Literarily.” That is how it should have ended. 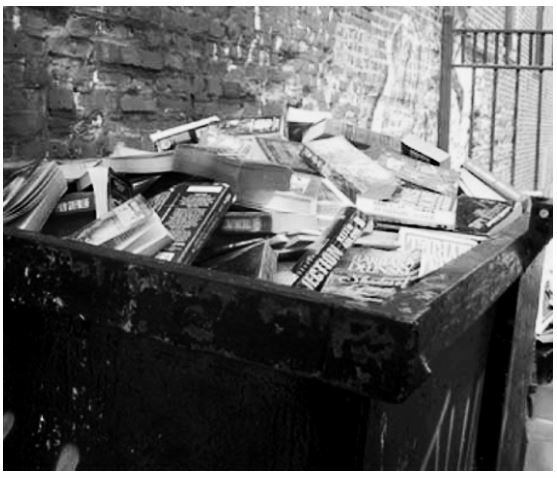 Because when I threw out the manuscript it became literally trash, literarily literally literary trash.